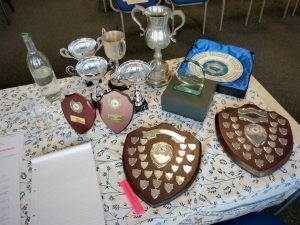 Presentations of the Mayor’s Annual Awards took place during the Annual Council meeting on Thursday 10 May 2018 at Hayle Day Care Centre. Mr John Broadbridge was selected as Male Citizen of the Year 2018/2019, posthumously. John was selected for his work for the Hayle Lions Club, most recently as President, running the fun day almost singlehandedly and acting as Santa. He also helped Hayle in Bloom, Marie Curie nursing and the Hayle Food Bank. He was also involved with the counting for the Poppy Appeal and had previously been very involved with scouting in the town. 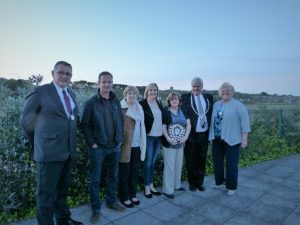 Sadly, John had died in February so the shield was presented to his wife, son and daughter. 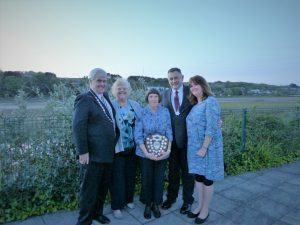 The Mayor presented the award for Female Citizen of the Year 2018/2019 to Mrs Alison Stuckey for her working extremely hard on a voluntary basis, in a variety of roles, for Hayle Day Care Centre. She is also heavily involved with the local U3A and was previously involved with the Hayle Twinning Association and Save Our Sands. 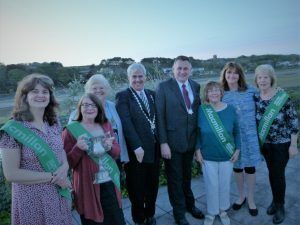 Macmillan Cancer Support Hayle Committee was chosen to receive this year’s award as Organization of the Year for their efforts to raise money for Macmillan Cancer Support, with raising over £14,000 in 2017 for The Cove at RCHT, Treliske. 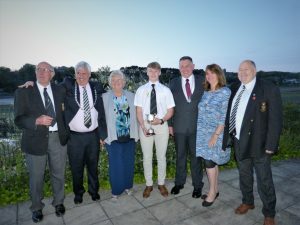 The small committee had formed over 30 years ago and now comprised a wider group of friends which organized regular coffee mornings and sales as well as an annual ball. The Mayor chose Hayle RFC Colts as the Youth Organization of the Year 2018/2019. The newly formed team recently played in and won the Cornwall plate competition 24- 7. Everyone was informed that this was the first year of the new Colts team, following amalgamation with Helston and a few players from St Ives and that there had been a shaky start to the season but then they had started to win games. The representatives of the Colts explained that they hoped to build on this initial success and they received the award on behalf of the whole team and support team.